Questions trouble people like us-those who have a to be in office every Monday. 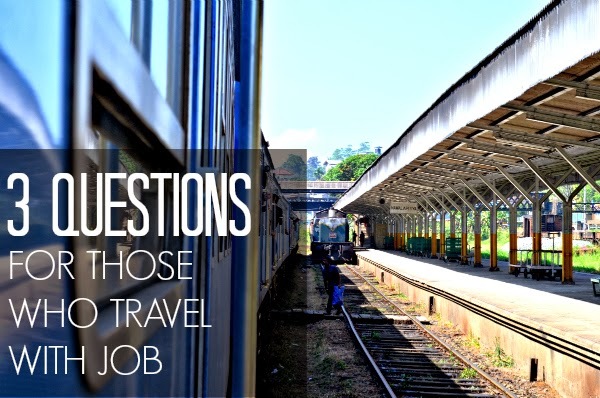 Even if you have the means to travel, these three questions will always haunt you. Even before we discuss how to make time for travel it is important we understand the kind of travel we are looking at. If you think your work can take a three month Europe trip you don’t need me to tell you where to go. Go anywhere you can afford to go to. We don’t have those many leaves or can afford to leave work alone for long periods. When I got my passport I had rosy dreams of beaches and forests with some Eiffel towers of the world thrown in. Even though I wanted to I was not travelling till we came across this challenge which required me to travel in my country. We live in India and people come here all the time. Most of them tell me it’s difficult to see India in a few months. I realized what I was missing. Travel does not mean I have to visit an exotic faraway place. It also meant I get to see the magic spread across my own land. Bottom line- start with your country. Is it too big? Start with your state and if that still is too much for you start with your city. Travel is not being away from home, it is meeting people and learning something new every time you travel. The dream destination you are saving up for will come in its due course but what is to stop you from visiting other wonders of the world and world is not devoid of them. Is there a travel season? Yes it is called peak season. It is that time of the year when everyone descends on a place. You find prices skyrocketing and reservations not available. Is it the only time I can travel? Definitely Not. We usually try to visit a place in off season. We get better rates and easy reservations also the locals are happier to see us. Be prepared you might miss a few peak hour time attractions but that’s not all that a place is about. Some things definitely have to be done when weather allows for it like river rafting, scuba diving and others. If you are interested in these then spend on doing these things you love and save up by travelling to other places in off season. It does not mean you completely disregard the precautions required for the weather you are venturing out in. Be it summers or monsoon or winters, take appropriate precautions. Getting sick or stuck while on a trip or vacation is not a desirable way to spend the few days you get off. There is no right way to travel but there are definitely wrong ways. Till you are not impacting the place and people you are visiting in a negative way you have all the right to travel your way. People with full time jobs usually have very limited time and a much bigger bucket list. Budget and time both become a constraint and you are left wondering how others travel. I am still trying to answer this question myself and would love to hear more from you on this. If you'd like to hear and read more about this just sign up in the sidebar for a chance to get free access to traveler toolkit. Let’s head into a world where your dreams come true. Bit too dramatic? I hope to inspire you to at least think about travelling to the closest town. These are great point that you have to share on the blog. Awesome! I am a businessman and your travel plan and instructions lead me to plan a summer vacation trip. Here I need your help to make my nyc to DC bus memorable. Who can I make this tour more exploit for my family? Please guide me! Glad that you like the post and site. I am even more happy that you are travelling this summer. What do you want to do and what are your biggest concerns? If you are looking to save money I suggest you look at cheaper transport options as well as accommodation through airbnb or couchsurfing if you are a member of the latter. If you can identify some free and fun things to do apart from the usual attractions that would make a huge difference both in your experience and budget. I have a post lined this Saturday which should help you iron out a lot of issues.